2x2inch Bronze Cube Mold - Gilson Co. Bronze Cube Molds are made of forged bronze and accurately machined for casting cubes in a diagonal arrangement. Wing-nut clamps secure mold halves to the detachable brass base plate. 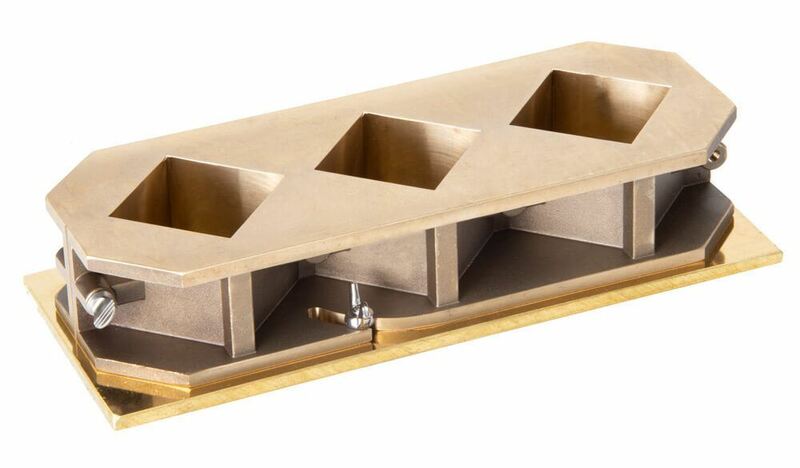 This is the mold of choice for testing of sulfur mortar capping compound cubes when fitted with the optional HM-299 Brass Cover Plate. The optional HM-309 1/2in thick Plastic Cover Plate also fits this mold for casting expansive grout cubes. HM-294 is for 2x2in (51x51mm) samples, while HM-294M is used with 50x50mm samples. HM-294C Bronze Cube Mold with Cover Plate, 2x2in (51x51mm) has machined alignment guides on top and bottom for easy, accurate positioning of included 0.25in (6.4mm) thick brass base and cover plates. It also comes with HM-298 Rubber Tamper. This mold is ideal for casting expansive grout samples as well as for conventional grouts and mortars, and is easily flipped over to compensate for worn top surfaces. Replacement Brass Cover Plates, Model HM-307C, are available separately.